Metropolitan Funeral Plan - Compare Funeral Plans in South Africa. On this page, we will be looking at some of the great benefits of using Metropolitan. This is an amazing cash funeral plan with a lot of benefits. Firstly, let’s discuss the provider. Metropolitan is one of the oldest insurance providers in South Africa. Not many companies can say they have been around since the 1800’s. Metropolitan has been serving our nation for more than 114 years. They do not only have branches in South Africa. You can also find Metropolitan in Namibia, Ghana, Botswana, Lesotho , Kenya, Nigeria, , and Swaziland. One of the reasons we really like this providers is they like giving back to the community. They have a very strong corporate social investment strategy. Metropolitan likes rolling up their sleeves and getting dirty to help the people who need it the most. Now, let’s look at what the policy has to offer. Metropolitan went to back the roots with their funeral plan. It’s a straight forward funeral policy without unnecessary filler benefits. We often see policies with benefits that are not relevant to the product at all. Some providers do this to make the policy appear better value for money. At the end of the day, you pay for every “benefit” on the funeral plan. We recently saw a funeral plan that comes with discounts on private security packages. We feel this is not always the best type of funeral plans. With the Metropolitan funeral plan, you get a cash only product. When we say a cash only product, we do not mean you do not get extra benefits. It simply means they do not arrange the funeral on your behalf. The provider will pay you a cash amount and you can arrange the funeral using multiple providers. There are no medical exams required. A Metropolitan funeral plan does have a standard 6 month waiting period. This is only for natural causes. You can get a maximum of R50 000 cover and it starts from just R36p/m. They try and settle all valid claims within 48 hours. 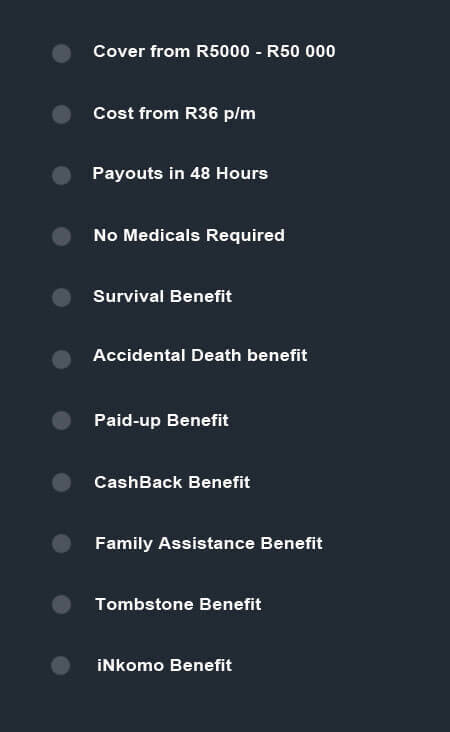 Some of the benefits on the plan Accidental Death benefit, CashBack Benefit, Paid-up Benefit, Family Assistance Benefit. These are all benefits that make the product unique. There are optional benefits to further increase the policy. Nobody wants to stress when it comes time to claim on an insurance product. This is the reasons why we suggest you always use a trusted provider. With Metropolitan funeral plans, you get a quality cash only policy. The biggest advantage of a cash only policy is freedom of choice. Your beneficiary can use multiple providers and shop for the best possible deals. Are you ready to get covered? Give us the opportunity to show you why we are an award winning broker. We take every client and treat them like our only client. All you need to do is complete our contact form. One of our friendly consultants will be in touch soon. We do not give your details to third parties. You will speak to one consultant from the beginning to the end. We look forward to spoiling you with our amazing service. To get started, simply complete the contact form below.